I feel like we have crested the hill with Project Nomad and from here it should be all downhill to the day it finally gets registered and I can drive it. 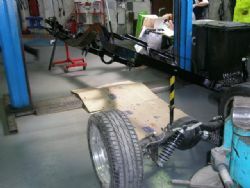 The last two days has seen me donning overalls and painting the chassis and from today the driveline components will be installed and it shouldn’t be too long before it gets a coat of paint. 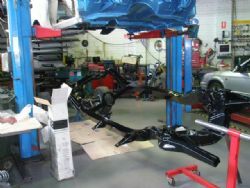 Quickfit Motorsports stripped the chassis of all the steering, A arms, rear four bar and diff and I sent it off to get sandblasted. I was going to get it powder coated, then changed my mind to two pack and finally decided to do it myself with POR 15. The final decision came down to longevity, toughness of finish and it also allowed me to have all the components look the same. Once POR 15 sets you can belt it with a hammer and you won’t chip it. It also provides great protection from rust and I could paint the diff housing to match all the bars, A arms and chassis. One of the pleasing aspects of POR 15 is you can apply it with a brush. It provides a nice smooth finish although you need to be careful applying it. I had the overalls and gloves on and still managed to get it on my skin, which is not good. The only way it comes off is over time – it has to wear off! In a few spots it soaked through the overalls while I was lying on the ground and a few splashes up the wrist and arm are still there and are likely to be for some time. As I have no intention of this being a show car I wasn’t too fussed about the finished job. You can spray it on and for the inside of the chassis rails and front cross member this would have been handy as there were numerous places I couldn’t get to with a brush. My theory is the body is going to cover it anyway, I’m going to drive it and there is no point being too precious about it as it will probably see a number of dirt roads. 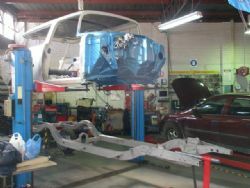 The extractors have been fitted to the block and once the motor, gearbox and suspension are installed the full exhaust system will be built. 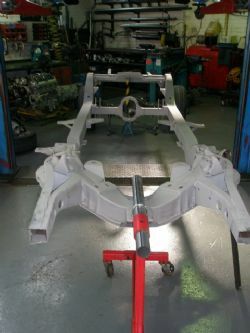 That will allow some time to get the driveshaft made and installed and then the body will be reattached to the frame. The final thing I will get Quickfit to do is send the computer for the LS2 off to get reprogrammed so when it is wired we can fire it up for the first time before it gets sent off to the trimmers for the last major job. All the metal parts that need chroming have been sent off and there were a lot of them. I am still waiting on the call that will tell me what can and can’t be done and hopefully the rear liftgate can be chromed with all the pitting fixed. I am under no illusion that it will be a cheap exercise and expect to take a second mortgage on the house to cover the bill. All up there were fifty seven pieces that needed chroming and I had purchased new bumper bars, grille bar and other bits that are not included in that number. If you don’t see any Project Nomad stories in the future you know I will have had a coronary at the quote!